Hello Oppo A71 2018 (CPH1801) owners, good news for you guys, now Oppo A71 CPH1801 Remove Pattern, Password, Pin Lock with Miracle and Fix Oppo Preloader problem, we all know now CPH1801 remove pattern lock is too difficult to remove without data loss, but now we find a way to remove it, follow the below tutorial. What is Screen Lock protection for Oppo CPH1801? 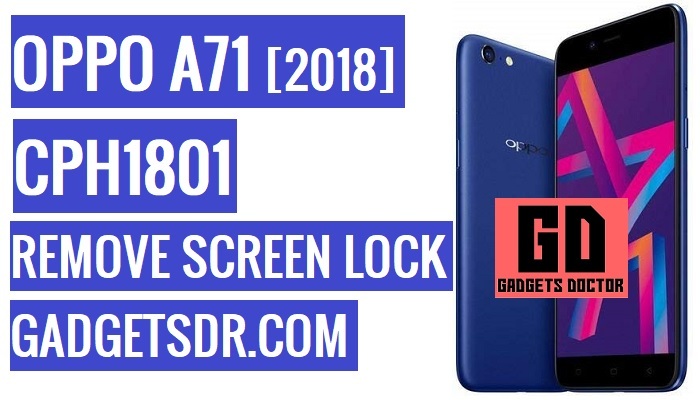 -To Oppo A71 CPH1801 Remove Pattern you need to download some files. check below you will get all the files, first of all, download the “Miracle tool” and Qualcomm USB driver. -Once downloading finish, then extract the Miracle tool to your desktop. -Then run the “Miracle.exe” from there. -Then go back to your desktop, then install Qualcomm USB driver.exe from there. -Once done, now put your device in download mode to successfully remove Pattern lock Oppo CPH1801. -Then press and hold the “volume up and Volume down button and then insert the USB cable”. -Then check your computer “Device manager” then there you will see “Qualcomm QD-HS USB driver” connected. Thanks for visiting us, Comment below if you face any problem With Oppo A71 CPH1801 Remove Pattern, remove Pattern lock Oppo CPH1801, we will try to solve your problem as soon as possible. you can check other some tutorial here to help you.